With Death In The Family culminating in such a poetic manner, and the hypocrisy of Damien dying off so close to the storyline, a sense of finality for Damian was not achieved with the death. The character had such an incredible arc from Batman And Son all the way over to Batman Inc. that proved he had potential further than what was being utilized. The fact that this mini-series about Damien is being published, seems like DC is admitting that this is true. Due to some recent events in Batman Inc. the character may not actually be dead. The question of whether this comic will work under an older Damian Wayne is very worthy of asking. 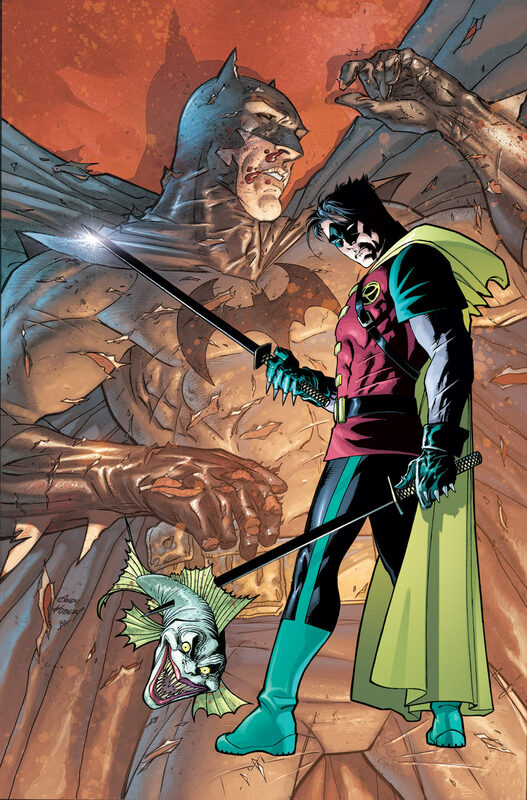 Can Damian function without his creator Grant Morrison or Batman And Robin writer Pete Tomasi? It is so refreshing to see someone have complete control over the DC Universe. Andy Kubert does some really bold maneuvers in this first issue, he breaks every single rule of storytelling. This definitely works in his favor, as this book is a massive thrill ride, not letting up for a second. When the creative was announced formally as Andy Kubert on writing and art duties, many had reservations on the quality of the storytelling. If anything, this has inspired the Kubert brother to tell a more interesting and engaging story that he has complete control over. Although this tale is certainly entertaining, by the end many will be unclear on where exactly the story is heading. Damian goes through a distinctive emotional journey culminating in some of the plot threads laid down in Grant Morrison. By the end, readers get the sense that the hero is perhaps on a redemptive journey of sorts. The bottom line, is that next issue there needs to a be a defined reason for why this story is taking place after so much plot is tackled here. It would also help if the dialogue was less on the nose at times, this tale is anything but subtle. Andy Kubert considerably begins to clean up his artwork here. There are many times in his professional career, where his work had too much raw energy contributing to some weird line work, and obscuring the good pencils. There are still an abundance of stray lines in this art, but the energy is channeled into a different spot. The cleaned up version of this Kubert brother is something that would be great to see more of in his future work. There are many splash pages in the book that are highly detailed, yet still contain a ton of free flowing energy. On every page there is something interesting to look at, whether it be strange layouts or capturing an old moment with some new flair. Kubert delivers an interesting interpretation of Gotham City that merits a return trip to a dead character. He proves that he is competent at both writing and drawing full comic book. While this first chapter is definitely worth the price of admission, it is unclear if the series will take a distinctive tone and have a clear purpose going forward.